There are currently 73 people online. Zalman shows off the CNPS12X, a new high-end cooler that weighs a whopping 1kg. The cooler features six direct-touch heatpipes which convey the heat to two heatsinks that are made almost entirely of nickel-plated copper. The fins are cooled by three fans, which have a minimum noise level of 22dBA. 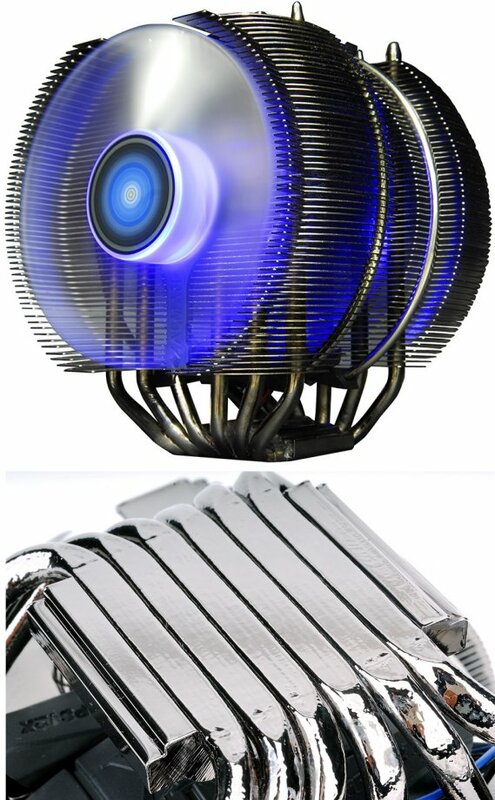 In Europe the cooler can be found for pre-order for just under 70EUR. Measuring 151 x 132 x 154 mm (L x W x H), and weighing exactly 1 kg, the CNPS12X uses a design that's essentially identical to that of the NH-D14 from Noctua, that of two fin stacks. It's just that the stacks here are somewhat circular in shape, and that the CNPS12X uses three fans: an intake (before the first stack), a conveyer (between the two stacks), and an exhaust (after the second stack). All three fans are 120 mm in size, and are illuminated by blue LEDs. The fans seem to be using 3-pin (voltage) method of speed control. Supplied with the cooler are three RC5 intermediate resistors, which make the fans spin at speeds between 850 and 1100 RPM with as low as 22 dBA noise output. Without the RC5, the fans spin between 950 and 1200 RPM, with at least 24 dBA noise output.